Quite frankly, you should have resisted. It's not particularly funny, and does nothing other than detract from your persona. Making fun of other peoples efforts in the open source stage is a poor show. My opinion of you has dropped. @IvanT: I expect if she do not like my joke, to tell me upfront and bluntly about that. 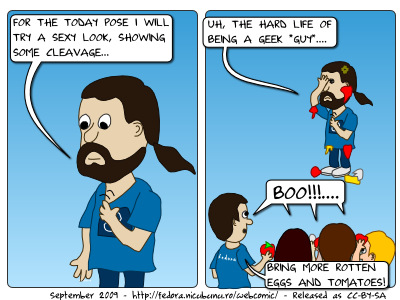 PS: if you don't get that, the bearded guy in this cartoon is *me*.